It was probably when I replayed the Battle of Teutoberger Wald from the Roman side for the 20th time that I realized just how deeply Field of Glory has sunk into my gaming routine. It’s a not daily fix like Dungeon Crawl is or Civ 4 was for many years. But it is a game I keep coming back to and that Slitherine and HexWar steadily improve and deepen. It’s one of the few wargames that I can say I happily play online against humans (because the battles are so short) and it’s a game whose expansions and variety promise years and years of enjoyment. FoG is now on its fifth expansion, Legions Triumphant, which takes the fun into the Imperial Age. The new expansion has a disappointing paucity of historical battles, but that’s always been a bit of a problem for the series. It is designed as a tabletop game where you create your armies in the Digital Army Generator (now there are hundreds of nations and allies to choose from) and then set them to work against each other in online play. A lot of the changes in the game since launch have been small ones. You can now give skirmish units specific behavioral orders on if and when they should evade melee combat. You can block evasion with proper placement now. Rules about facing and units ignoring orders have been clarified, and the there are tiny little tweaks and bug fixes in each of the many patches. (Now up to version 1.50). Would be nice if they fixed some of the spelling errors in the army lists and battles, but you can’t have everything. The game gets more polished and easier to understand in every update. I’ve written before about my love of the old Encyclopedia of War: Ancient Battles, and increasingly Field of Glory is becoming that. I think a random battle generator would be nice, but the flexibility of the DAG with the hundreds of maps to choose from plus the amazingly intuitive scenario editor have Field of Glory fighting with War in the East as the best wargame of the last five years. I keep coming back to Field of Glory for more than the setting, though that is an attraction. The AI is not great, which is almost a draw in a game like this. Most single player battles will take no more than 30 minutes to resolve, many are much shorter. The fun is in trying to craft the perfect battle plan. In Teutoberger Wald, can your Romans survive at all? Can you as Hannibal destroy an entire army at Trasimene or Cannae? When I take the side of Lucullus in Tigranocerta, I have Yakety Sax playing in my head as the Armenians run for the hills in a spiral of fragmenting and routing units. I’ve yet to create that beautiful double envelopment that utterly destroys the enemy. But there have been some moments of beauty, like in my Bibracte battle tonight that played out much like the historical one. The Germans pushed my Romans hard at the beginning and their charges shattered some of my front and one of my wings completely. But once the troops are engaged, there isn’t a lot that can beat Roman swordsmanship and once the barbarians were forced back to the river, that was it. Three more expansions have been announced (an Ottoman themed one, one for the Byzantine Empire and one for Vikings) but so far not the pre-classical Near East one I’d love to see. Maybe next year. I will probably do a game diary once I talk Bill Abner into finally buying this and playing me. I think he’s chicken. What is the best place to start with the Field of Glory series? Buy the core game and then the expansions that interest you. The core game has enough to let you know whether it is something you are interested in and comes with a dozen battles. I mean… besides the base game. Oh… sorry. Didn’t see your reply. Thank you. Your best bet is to pick an expansion by which army you want to play. I like the Alexandrian Macedonians and Republican Romans, so I picked up Rise of Rome and Immortal Fire first. Your preferences may vary. Also, I think I may actually build an army for the tabletop version. 15mm ancients are way cheaper than stuff from Games Workshop and the like. Shouldn’t you update the website and remove your email so we can send suggestions for 3 Moves Ahead? I wanted to suggest you guys talk about Secret World, the new MMO from FunCom. Looks pretty sweet. The email on the sidebar is for me. This is still my blog. The 3MA information including Rob’s address is now in the page marked up top. And I will still answer podcast emails and make sure Rob gets them. 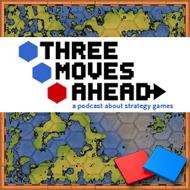 An MMO on a strategy gaming podcast? It’s more interesting to read Troy’s ruminations than it is to actually play the game. I find most of my battles to be shoving matches and flanking attacks until one side’s morale collapses and they run for their lives. It may be realistic but I’m not all that captivated by the graphics or the gameplay. But I enjoy reading other people’s take. It’s really an excellent and simple system. But yes, it does come down to pushing and morale checks. And that is not to everyone’s taste. A playthrough or walkthrough would be great. Like Mr. Strange, I enjoy reading about (and listening to) strategy gaming almost more than playing, as I, for the life of me, can’t seem to figure out how to make sense of hex games. So any post revealing how, Troy, you and others think about the opening moves, how you read and parse data, etc., would be phenomenal.